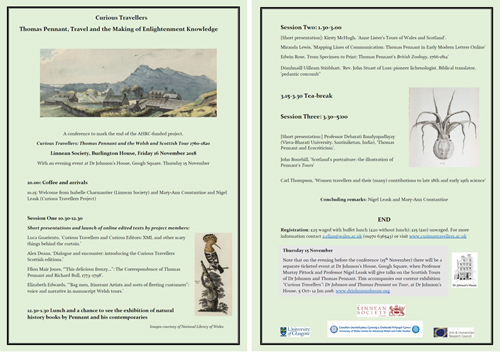 For those with an interest in the history of travel writing and in the work and preoccupations of Fellows of the Royal Society in the second half of the eighteenth century, registration is open at present for the conference ‘Thomas Pennant, Travel, and the Making of Enlightenment Knowledge’. The day’s event is to be held at the Linnean Society, London, on Friday, 16 November, and it is being organized to mark the conclusion of the Curious Travellers: Thomas Pennant and the Welsh and Scottish Tour 1760–1820 research project (which has been funded by the Arts and Humanities Research Council). The conference coincides with the exhibition ‘Curious Travellers’: Dr Johnson and Thomas Pennant on Tour that runs until mid January 2019 at Dr Johnson’s House, Gough Square, London (for further details, please see the previous post on this blog). On the evening preceding the conference (Thursday, 15 November), a separate ticked event will be held at Dr Johnson’s House, during which Professor Murray Pittock and Professor Nigel Leask will deliver talks on the Scottish Tours of Dr Johnson and of Thomas Pennant. Should you be interested in attending either event, further information is to be found in the conference poster (which may be downloaded here) or on the Curious Travellers’ website. This entry was posted in Uncategorized on October 25, 2018 by Miranda Lewis. As the Cultures of Knowledge project and EMLO embark on the next leg of their investigative early modern correspondence journey (details of which will follow in a forthcoming blog post), it is a tremendous pleasure to announce publication this week of a catalogue set to establish itself as one of the foundation pillars of early modern transatlantic communication: that of John Winthrop the elder and his son, John Winthrop the younger. For the final two decades of his life, John Winthrop the elder (1588–1649) served as the governor of the Massachusetts Bay Colony. Having crossed the Atlantic to New England in 1630 aboard the Arbella, John the elder proceeded to play a central role in establishing and refining the civil and religious governance of the Colony. At the time of his father’s departure for New England, John Winthrop the younger (1606–1676) remained in England for an additional year to care for his step-mother Margaret Tyndal, his younger siblings, and his own new wife Martha Fones, in addition to the family’s interests, before setting sail himself in August 1631. John the elder’s sister, Lucy (thus an aunt of the younger John), was mother of the future diplomat and financial reformer, George Downing (c. 1624/25–1684); in 1638, at the invitation of her brother, Lucy and the Downing family emigrated also to Massachusetts. John the younger (who had been educated at Trinity College Dublin and had travelled extensively in Europe, progressing to the east as far as Constantinople) flourished in New England and developed there his interest in practical natural philosophy. He was an industrious and reliable correspondent — one who may be tipped to continue to ‘grow’ within the underlying networks under investigation in EMLO. From the far side of the Atlantic, he maintained a broad circle of friends and key contacts in the country of his birth. He undertook the return journey to England and stayed for a year between 1634–5, upon which occasion he was engaged by a group of puritans sympathizers — amongst whom numbered Robert Greville, second Baron Brooke; William Fiennes, first Viscount Saye and Sele; and Sir Arthur Heselrige — to establish a colony at the mouth of the Connecticut River. In honour of Winthrop’s sponsors, the name of the resulting settlement was an analgam: ‘Saybrook’. The calendars of correspondence for the Winthrops published in EMLO have been based on the impressive editions produced by the Massachusetts Historical Society, Boston. 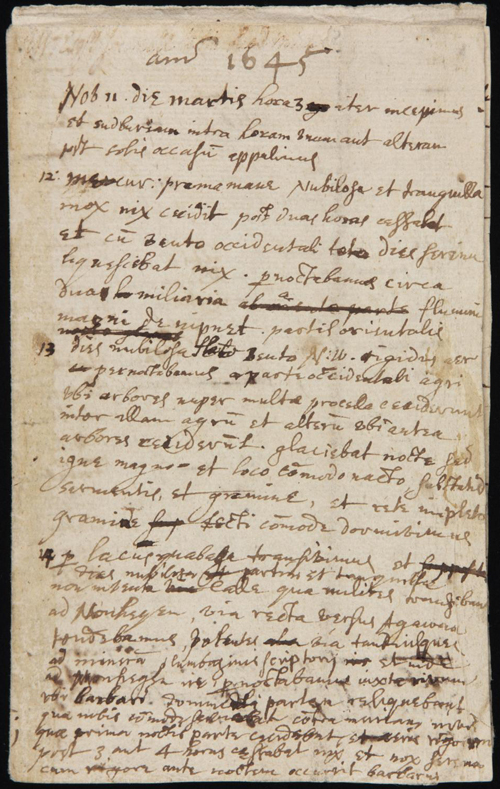 Coupled with the letters that are converging at present in EMLO, a focus on the Winthrops and their work in New England heralds a welcome extension to the analysis of the circles surrounding Samuel Hartlib and a number of early members of the Royal Society. It is anticipated that the metadata collated for these networks in the forthcoming phase of the Cultures of Knowledge project’s work will swell and tighten. Do look out for the blog in which we will explain these plans and, in the meantime, courtesy of the links to the texts of many of the Winthrops’ letters available at the Winthrop Papers Digital Edition, please explore the archive. It is hoped that the correspondences of these two early New England settlers will establish a firm foundation upon which later transatlantic epistolary exchanges may be layered. This entry was posted in Uncategorized on October 14, 2018 by Miranda Lewis.